Before we get to the outcome of the recent Windsor Utilities Commission meeting let’s take a look at the local media coverage. Fluoride Free Windsor and local Safe Water Advocates want to thank our media sources for doing such an amazing job of helping Windsor/Essex residents become informed about the facts of artificial water fluoridation! Fluoride Free Windsor, Council of Canadians, Canadian Medical Geology Association, a Registered Nurse and several local residents presented to the Windsor Utilities Commission (WUC) board members at a special fluoridation meeting held on Wednesday, February 29, 2012 to make the case for SAFE WATER. The outcome of the meeting was a motion made by Councillor Dilkens and seconded by Councillor Marra to recommend that the City of Windsor cease fluoridation. All members of the commission, except for Councillor Sleiman, voted in favour of the motion. We wish to extend a huge thanks to Mr. Dilkens and Mr. Marra, as well as the commissioners, for voting in favour of SAFE WATER. For more videos of delegates’ presentations visit the Fluoride Free Windsor YouTube channel. A May 23, 2006 WUC fluoridation report for City of Windsor Council states “It should be noted that The Windsor Utilities Commission reduced the level of fluoride from 1.2 mg/l to 0.65 mg/l several years ago.” which begs the question: Does that mean that for several decades WUC customers got twice the concentration of fluoride that they tell us is safe today? Will we be told in the future that the ‘safe’ limit is lower still, as fluoride lobbyists find it more and more difficult to disregard the mounting evidence that fluoride accumulates in our bodies and in our environment, causing harm? UNWANTED HEALTH EFFECTS? But our Medical Officer of Health and local dentists keep saying there are NO unwanted health effects. The WUC report quotes the Health Canada (2007) review that indicates “fluoride in drinking water is unlikely to cause adverse health effects…” and “fluoride in drinking water is unlikely to be the cause of moderate dental fluorosis…” (does that mean it is likely to be the cause of mild dental fluorosis?) As parents trying our best to protect our children from unnecessary chemicals, should we be reassured with Health Canada’s ‘unlikely to cause harm’ fluoridation endorsement? Can they back up this endorsement with safety studies? Fluoride lobbyists admit that fluoride is harmful and can only claim it is ‘safe and effective’ at optimal levels. The problem is, that ‘optimal level’ has continued to be decreased ever since the water fluoridation experiments began. Why is that? For one thing, the science doesn’t support the ‘safe and effective’ propaganda. And so as decades pass and we’re in our third generation, of test subjects ingesting fluoride, we see more and more signs of fluoride toxicity – and so instead of our health authorities being PROTECTIVE and taking PRECAUTION we see them being reactive to mounting evidence of harm and lowering the fluoride limit in our drinking water time and again all while desperately defending this policy in an attempt to retain credibility. It seems that the opposite is happening. By defending worn-out policy, health and dental authorities are losing credibility when they do not take a precautionary stance that is protective of all. Residents should be allowed to monitor their own fluoride intake while depending on the tap water for bathing, cooking and drinking. Public health is NOT monitoring our fluoride intake from all exposures nor have our communities been assessed to determine what our fluoride intake is from all available sources. Some people are sensitive to fluoride, some people need to avoid it because they suffer from a suppressed thyroid or because they have a compromised immune system. Current water fluoridation concentrations are not protective of formula fed infants or aquatic species and claims of safety at any level is questionable, as we’ll soon see. What does the Precautionary Principle say? The principle requires that we consider the possible benefits, the possible harms and whether there are feasible alternatives for producing the benefit. For fluoride, the benefit is slight if any and does not pertain to a threat to public health. Possible harm is great and almost certain for some harm like dental fluorosis and thyroid suppression. There are harmless and accessible alternatives for attaining the desired benefit. And so, fluoride does not pass the test of the precautionary principle. Anyone who believes that ingesting fluoride is contributing to their dental health can simply ingest more of the readily available foods that contain fluoride while leaving our municipal drinking water free of it so that it is as safe as possible. See here the USDA National Fluoride Database of Selected Beverages and Foods. There is no shortage of access to fluoride but avoiding it is near impossible when it is in our tap water. For those interested in SAFE methods of preventing dental caries see these Alternatives to Fluoride. How SAFE is hydrofluorosilicic acid? What measures exist to ensure it is SAFE for us to ingest every day of our lives? The Safe Drinking Water Act (2002) is clear that water systems must meet licensing requirements; the license (Schedule B, Section 14.0) requires that chemicals used meet the Standard NSF60. This standard provides criteria to conduct a toxicological risk assessment. This criteria was confirmed by WUC Chief Operating Officer, John Stuart, in the report dated February 17, 2012 submitted to commissioners for the purposes of the fluoridation meeting. The legislation is in place for safety criteria. So why are there no safety studies? See here video coverage for the WUC meeting where administration admits no toxicological safety studies have been completed (in the 60 years of forcing this hazardous waste on us!). The video demonstrates how health authorities know full well that these safety studies do not exist and yet continue to promote the policy as ‘safe and effective’. There is no scientific consensus that ingesting hydrofluorosilicic acid is safe. There are no safety studies to prove it is safe. More and more municipalities are becoming aware of this glaring oversight and are ending the fluoridation experiment. 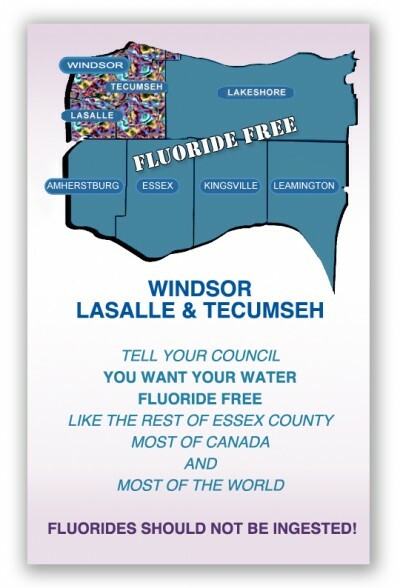 Let your Windsor, Tecumseh and Lasalle councillors know that you want them to follow the Windsor Utilities Commission’s recommendation to cease artificial water fluoridation to make our municipal drinking water supply as SAFE as possible. And allow us to enjoy Fluoride Free Water like the rest of Essex County, most of Canada and most of the World. Windsor Utilities Commission is the ONLY water supplier in Windsor/Essex County that artificially fluoridates its drinking water supply. Would the ‘Safe’ claim hold up in a Court of Law? Fluoride lobbyists claim that ingesting fluoride is safe and that no credible evidence exists to show that it is harmful. They also admit that the actual product, hydrofluorosilicic acid, we’re ingesting has never undergone safety tests. No tests to prove safety and no credible evidence to show harm (if you don’t look, you can’t see!). This kind of double-speak is quite common in the fluoride lobbying literature. However, the law is clear – chemicals added to our water supply MUST meet standards and those standards include toxicological testing. So decades old public policy and endorsements aside, would the claim that ingesting hydrofluorosilicic acid is safe, hold up in a court of law? This is the question Windsor, Tecumseh and Lasalle councillors need to ask themselves when they finally decide yay or nay for continuing to mass medicate residents without their informed consent. With a warning like that coming from the Province, councillors must be fully certain that the product they’ve chosen to mass medicate their constituents with is, indeed, safe and effective, as the fluoride proponents claim. Because those fluoride lobbyists will not shield municipalities from legal liability. Fluoride Free Windsor members have been doing their best to arm councillors with credible fluoridation information, including providing them with the Water Fluoridation Expert list, so councillors will have several professionals to turn to for the truth about the marketing claims that fluoride is safe and effective. These experts can and will help councillors make informed decisions that are protective of all constituents and adhere to environmental legislation. Following is a presentation titled NO MEANS NO that very appropriately highlights the fraudulent NSF certification that municipal governments are relying on as the safety standard for hydrofluorosilicic acid. Thank you to Carole Clinch of Citizens for Safe Water. 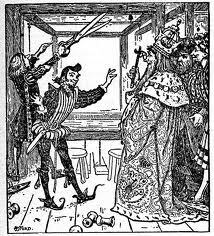 In pursuit of an alternate approach to exposing and overturning municipal water fluoridation practice, we may wish to consider and learn from the story “The Emperor’s New Clothes” written by Hans Christian Andersen (circa 1837). In the end it all came down to a little child, whose innocent voice, focused by child-like candour and reason, brought forth the truth. That story goes as follows, with these Canadian fluoridation connotations inserted for humour as well as thought provocation. It is hoped you enjoy the read and receive the relevant and inspiring underlying message. Many, many years ago (now) lived an emperor (Health Canada), who thought so much of new clothes (fluoridation) that he spent all his money (taxpayer’s money) in order to obtain them; his only ambition was to be always well dressed (heralded as one of the 10 best… in the 20th century). He did not care for his soldiers (people), and the theatre (hard science) did not amuse him; the only thing, in fact, he thought anything of was to drive out and show a new suit of clothes (push fluoride whilst donning a protective Teflon suit, also made from fluoride). He had a coat (biased fluoride study of poor quality) for every hour of the day; and as one would say of a king “He is in his cabinet” (has title and office so must know what of he speaks), so one could say of him, “The emperor is in his dressing-room (sure must know his stuff about fluoride)”. The great city (Health Canada Office) where he resided was very gay (politically worried); every day many strangers (for and against fluoridation) from all parts of the globe arrived. One day two swindlers (fluoride industry promoters) came to this city; they made people believe that they were weavers (good scientists), and declared they could manufacture (spin from myth and environmental waste) the finest cloth (inorganic fluoride) to be imagined. Their colours and patterns (hydrofluorosilicic acid, sodium fluorosilicate, and sodium fluoride), they said, were not only exceptionally beautiful (safe and effective), but the clothes made of their material (water-based smokestack emission scrubbings from phosphate fertilizer production) possessed the wonderful quality of being invisible to any man who was unfit for his office or unpardonably stupid (so politically obtuse as to admit causal harm, having used this cheapest toxic fluoride this long). “That must be wonderful cloth,” thought the emperor (Health Canada). “If I were to be dressed in a suit made of this cloth (Teflon cloth made from fluoride) I should be able to find out which men in my empire were unfit for their places (spoke the truth about fluoride), and I could distinguish the clever (anti- fluoridationists) from the stupid (pro-fluoridationists). I must have this cloth woven for me without delay (without science).” And he gave a large sum of money (more taxpayer’s money) to the swindlers (fluoride industry promoters), in advance (without toxicology research), that they should set to work without any loss of time (without bogging down in any substantive research). They set up two looms (naïve medical officers1 and naïve dentists2), and pretended to be very hard at work (many speaking junkets without science properly reviewed or even properly cited), but they did nothing whatever (no substantive science) on the looms. They asked for the finest silk and the most precious gold-cloth (even more taxpayer’s money); all they got they did away with (gave to offset the fluoride producing industry’s environmental disposal costs), and worked at the empty (non-science based) looms till late at night (until the educated science-citing anti-fluoride public became exhausted and anguished). “I should very much like to know how they are getting on with the cloth (‘spinning’ things around),” thought the emperor (Health Canada). But he felt rather uneasy when he remembered that he who was not fit for his office could not see it (not ‘spin’ as good as the rest of them). Personally, he was of opinion (must believe) that he had nothing (no science) to fear, yet he thought it advisable to send somebody else first (the most arrogant and unknowing of the dental profession) to see how matters stood. Everybody (pro-fluoridationists) in the town knew what a remarkable quality the stuff (hydrofluorosilicic acid) possessed (although few could even spell or pronounce hydrofluorosilicic acid despite all the ‘scientific reviews’ and ‘panel discussions’ claimed) and all were anxious to see how bad or stupid (intelligent) their neighbours were (anti-fluoridationists who could spell and pronounce hydrofluorosilicic acid because they had thoroughly reviewed the science). We are pleased to hear that,” said the two weavers (fluoride industry lackeys), and described to him the colours and explained the curious pattern (H. Trendley Dean’s ‘curious’ naturally occurring fluoride research). The old minister listened attentively, that he might relate to the emperor what they said; and so he did. Now the swindlers (fluoride industry promoters) asked for more money, silk and gold-cloth (further taxpayer’s hard earnings), which they required for weaving (promotional engagements and disposing of this toxic waste). They kept everything (profits beyond promotion and/or disposal costs) for themselves, and not a thread came near the loom (funded fluoridation’s scientific research), but they continued, as hitherto, to work at the empty looms (in the absence of empirical, peer-reviewed, published, variable controlled, statistically significant, scientific evidence). Soon afterwards the emperor (Health Canada) sent another honest courtier (willing but naïve dentist2) to the weavers to see how they were getting on, and if the cloth was nearly finished. Like the old minister (Public Health), he looked and looked but could see nothing, as there was nothing to be seen (no evidence supporting causal reduction of dental caries due to drinking fluoridated water). “Is it not a beautiful piece of cloth?” asked the two swindlers (fluoride industry promoters), showing and explaining the magnificent pattern (questionable science), which, however, did not exist (remained questionable). “I am not stupid (I am a credentialed important person),” said the man (naïve dentist2). “It is therefore my good appointment for which I am not fit (I don’t know anything about systemic ingestion of hydrofluorosilicic acid). It is very strange (why send me… I’m a dentist… I’m not trained in toxicology or tissues and organs beyond the mouth), but I must not let any one know it;” and he praised the cloth (drink-up everyone! ), which he did not see (even understand), and expressed his joy at the beautiful colours and the fine pattern (promotion money that could be made if this stuff were proven safe and effective). “It is very excellent (keep fluoridating),” he said to the emperor (Health Canada). Everybody in the whole town talked about the precious cloth (water fluoridation). At last the emperor wished to see it himself (try, at least, to find some supportive study abstracts – but not heavily review unsupportive science), while it was still on the loom (still possible to bury this issue once more). With a number of courtiers (more naïve dentists2), including those who had already been there, he went to the two clever swindlers (fluoride industry promoters), who now worked as hard as they could, but without using any thread (any gold-standard, empirical, peer-reviewed, published, variable controlled, statistically significant, scientific research). “Is it not magnificent (look at all the claimed cavity reduction)?” said the two old statesmen who had been there before. “Your Majesty must admire the colours (safety) and the pattern (effectiveness).” And then they pointed to the empty looms (dental libraries devoid of any “Fluoride” journal), for they imagined the others could see the cloth (just trust us, we don’t actually need to prove ourselves… we’re credentialed for F’n4 sake). The emperor (Health Canada) and all his barons (spin-team) then came to the hall (press conference); the swindlers held their arms up as if they held something (science-like) in their hands and said: “These are the trousers (dental health benefits)!” “This is the coat (refutations of health harm)!” and “Here is the cloak (cloak of ignorance whilst hiding behind titles and name dropping)!” and so on. “They are all as light as a cobweb (ephemeral), and one must feel as if one had nothing at all upon the body (no risk of health harm); but that is just the beauty of them.” “Indeed!” said all the courtiers (naïve dentist2); but they could not see anything, for there was nothing to be seen (these guys know… we don’t really need to check for ourselves… right?). 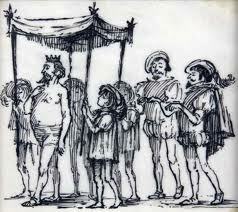 “Does it please your Majesty now to graciously undress,” said the swindlers (fluoride industry promoters), “that we may assist your Majesty in putting on the new suit before the large looking-glass (a renewed and more sophisticated scientific public opinion)?” The emperor undressed (what choice does Health Canada have now), and the swindlers pretended to put the new suit upon him, one piece after another; and the emperor looked at himself in the glass from every side (saying look… no horns3). The master of the ceremonies announced that the bearers of the canopy, which was to be carried in the procession, were ready (let’s sell this water fluoridation as an ‘elixir’ of cavity prevention). “I am ready,” said the emperor. “Does not my suit fit me marvelously?” Then he turned once more to the looking-glass, that people should think he admired his garments (yeah… I can live with myself… the money’s good… not to mention my revered status). The chamberlains (Municipalities, and Provincial Ministries of the Environment), who were to carry the train, stretched their hands to the ground as if they lifted up a train, and pretended to hold something in their hands; they did not like people to know that they could not see anything (Health Canada’s holding the bag on this one… right? It’s Ministries of the Environment? Anybody check out the law here?… WHAT?… MUNICIPALITIES GET LEFT HOLDING THE BAG!). The emperor (Health Canada) marched in the procession under the beautiful canopy, and all who saw him in the street and out of the windows exclaimed: “Indeed, the emperor’s new suit is incomparable! What a long train (list of fluoridation endorsements) he has! How well it fits him!” Nobody wished to let others know he saw nothing (no real benefit to water fluoridation), for then he would have been unfit for his office or too stupid (rebuked… or worse… never re-elected due to such an oversight!). Never emperor’s clothes were more admired (what a F’n4 predicament). “But he (Health Canada) has nothing on at all,” said a little child at last. “Good heavens! Listen to the voice of an innocent child,” said the father, and one whispered to the other what the child had said. “But he has nothing on at all (no safety or efficacy research of any import),” cried at last the whole people. That made a deep impression upon the emperor (Health Canada), for it seemed to him that they were right; but he thought to himself, “Now I must bear up to the end.” And the chamberlains walked with still greater dignity (yet again lowering fluoride concentrations in municipal drinking water without ever addressing the real issues at hand), as if they carried the train which did not exist. 1 “Naïve medical officers” does not express or imply every medical officer nor all medical officers. 2 “Naïve dentist(s)” does not express or imply every dentist nor all dentists. 3 “No horns” is in reference to a comment made by Health Canada’s Chief Dental Officer of Health speaking in Dryden, Ontario on April 1st, 2008 whereby he stated; “When I walked down through the centre of Dryden, I didn’t see anyone growing horns, and you guys have been drinking fluoridated water for forty years. So please don’t feel it’s going to cause huge health problems to you because it isn’t.” On April 14th, 2008, 87% of Dryden’s voting public decided to turn off their water fluoridation. 4 “F’n” refers to fluoridation. Young girl who stepped up to the podium during the Citizens for a Safe Environment open forum on water fluoridation, held in downtown Toronto on August 11th, 2008; in conjunction with the International Society for Fluoride Research Conference and the Fluoride Action Network Conference, all being covered by the media around the same time frame. In the end it all came down to a little child, whose innocent voice, focused by child-like candour and reason, brought forth the truth. Why not a Fluoride Free Essex County? On January 9, 2012 – Dr. Heimann of the Public Health Unit and Dr. Frank of the Essex County Dental Society (neither of which are fluoridation experts) presented their case as to why Amherstburg should continue fluoridation. Actually, Dr. Heimann’s presentation stated that he wanted Amherstburg to reinstate fluoridation since they’d stopped in April 2011, but Mayor Hurst was quick to cut off Dr. Heimann and claimed that Amherstburg has never stopped fluoridating. Hmm, is that true? Have there been no disruptions in the fluoride feed in Amherstburg’s municipal water supply? It seems the Town of Amherstburg is currently faced with the decision to spend lots of money upgrading their artificial water fluoridation equipment or end the practice of medicating their drinking water with hydrofluorosilicic acid. Fluoride Free Windsor has been approached by concerned citizens of Amherstburg asking us for help in educating council members of the risks of this gone-too-long experiment. We’ve sent them some information and the list of Fluoride Experts willing to help educate council members and aide them in making an informed decision. It remains to be seen what Amherstburg Council will decide. The area’s medical officer of health is urging Amherstburg council to keep fluoride in the town’s drinking water. Doctor Allen Heimann said fluoride is not harmful, as some people claim, and it’s the most economical way to keep teeth healthy. Amherstburg is now the latest local community to embark on a fluoride debate. Last fall, Lakeshore stopped adding fluoride at its Stoney Point treatment plant. That town council unanimously decided to stop adding it. In Windsor, a group called Fluoride Free Windsor boasts 200 members and wants it removed from the city’s water. The Windsor Utilities Commission is studying the issue. However, Windsor is contractually obligated to add fluoride until 2014. That licence is up for renewal in 2014. Only then could fluoride be removed by vote of council. CBC reporters were sent a Retraction Request[i] with respect to this statement: “When fluoride is removed from the drinking water you get an increase of dental decay and dental carries,” Heimann said. In November 2011, CBC reporter, Pat Jeflyn reported on the issue of water fluoridation in Windsor and when Dr. Frank made false claims that dental caries double in communities when fluoridation is ended Jeflyn wrote: However, research done for the ministry of health at the university of Toronto in 1999 concluded: “the few studies of communities where fluoridation has been withdrawn do not suggest significant increases in dental caries.” There have been many communities that have ended fluoridation since 1999 and many more studies conducted, too. So, it is unclear why CBC let this false statement slide in the above article about Amherstburg – hopefully they’ll print the retraction we requested. One Amherstburg council member asked the presenters about Dental Fluorosis in the community. Dr. Frank answered that there wasn’t much dental fluorosis in the community and that it was only a cosmetic effect, hardly detectable. When we contacted the Essex County Dental Society a few months ago and asked if they had statistics of dental fluorosis rates for this area and if they had comparisons of the dental fluorosis rates of the non-fluoridated communities (Kingsville, Leamington, Essex, Ruthven, Wheatley, Harrow, Lakeshore) with the communities that are fluoridated (Windsor, Tecumseh, Lasalle and Amherstburg), they said they had no such statistics – so, we’re not sure where Dr. Frank is getting his information that he can tell Amherstburg council that there isn’t much dental fluorosis in our area. Perhaps it is the method by which dental fluorosis is diagnosed, or not diagnosed, that gives Dr. Frank the confidence to say dental fluorosis isn’t a concern? : “Dean’s Dental Fluorosis Classification System” calls for dentists to ignore the worst-affected tooth and base the diagnosis on the second-worst-fluoride-stained tooth. So if the teeth are unevenly or irregularly affected, the most visibly stained tooth is ignored, for purposes of classifying the condition – resulting in a downplaying of the disfigurement caused by fluoridated water and other ingested fluorides. What is dental fluorosis anyway? Is dental fluorosis only a cosmetic concern, as dental health authorities’ claim? SOURCE: Dr. Hardy Limeback, Head of Preventive Dentistry, University of Toronto. (2000). Why I am now Officially Opposed to Adding Fluoride to Drinking Water. SOURCE: Colquhoun J. (1997). Why I changed my mind about Fluoridation. Perspectives in Biology and Medicine 41:29-44. SOURCE: Environmental Working Group, “National Academy Calls for Lowering Fluoride Limits in Tap Water”, March 22, 2006. SOURCE: Alarcon-Herrera MT, et al. (2001). Well Water Fluoride, Dental fluorosis, Bone Fractures in the Guadiana Valley of Mexico. Fluoride 34(2): 139-149. 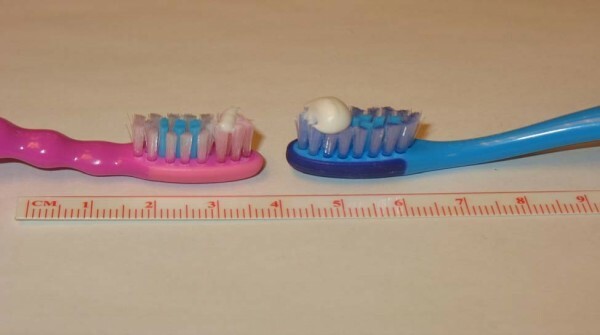 Is dental fluorosis caused by children swallowing fluoridated toothpaste? Artificial water fluoridation proponents can’t seem to face the paradox that we’re told NOT to swallow (pharmaceutical grade) fluoridated toothpaste but DO swallow (industrial by-product/waste) fluoridated water. And when this ingested fluoride causes problems they claim it is because we’re swallowing the fluoride they tell us not to and not because we’re swallowing the fluoride they do tell us to – anyone else see a logical problem with this argument? Dental fluorosis rates continue to increase since the fluoridation experiment began. According to the Ontario Ministry of Health and Long Term Care 1999 Report , incidence of dental fluorosis is nearly twice as prevalent in communities with fluoridated water, compared to communities that do not fluoridate their water. Dental and Health Authority claims aside – logic tells us, dental fluorosis is caused by the fluoride you’re ingesting – wherever that fluoride may come from. The science and statistics are convincing, fluoride can do a lot of harm and when fluoridation is ended both dental caries rates and dental fluorosis rates decline. In case you’re not convinced check out these research studies done in British Columbia, published in a Danish Journal called Community Dentistry and Oral Epidemiology (Why a Danish journal when these are Canadian studies? ): In Patterns of dental caries following the cessation of water fluoridation, researchers compared prevalence and incidence of dental caries between fluoridation-ended and still-fluoridated communities in British Columbia, Canada. The prevalence of dental caries decreased over time in the fluoridation-ended community while remaining unchanged in the still-fluoridated community. Five years later in the same Danish journal these same researchers published Changes in dental fluorosis following the cessation of water fluoridation about the prevalence of dental fluorosis after water fluoridation ended. When fluoride was removed from the water supply the prevalence and severity of dental fluorosis decreased significantly. One can ponder what would have happened to Canada’s artificial water fluoridation practice if these two studies had been published together in Canada for Canadian policy makers to review. According to the Canadian Dental Association, Use of Fluorides in Caries Prevention: children under 3 need to be assessed for risk of dental caries by a professional and if they are at risk “the child’s teeth should be brushed by an adult using a minimal amount (a portion the size of a grain of rice) of fluoridated toothpaste. Use of fluoridated toothpaste in a small amount has been determined to achieve a balance between the benefits of fluoride and the risk of developing fluorosis. If the child is not considered to be at risk, the teeth should be brushed by an adult using a toothbrush moistened only with water. How many parents know about the CDA recommendation to use ONLY water or a grain of rice sized amount of fluoridated toothpaste? When was the last time you saw an advertisement for toothpaste with only a grain of rice sized amount on the brush? This brings us back to the CBC News article above. 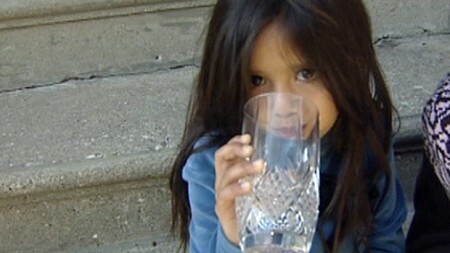 It is ironic that CBC used the picture of this particular child drinking water. You see, this little darling has the signs of dental fluorosis. She was exclusively breast-fed, got little if any processed drinks, eats mostly organic food, has never used fluoridated toothpaste or fluoride supplements – but drank lots and lots of municipally fluoridated water, more than anyone else in her family. Her parents believed that the tap water was safe and that water was better for her to drink than anything else. When her parents started noticing spots on her teeth they took her to the dentist, she was only 2. The dentist told them to rub fluoride on her teeth, they were not told anything about dental fluorosis or that their child had been over-exposed to fluoride. Doing their own research they discovered that the spots on her teeth looked exactly like what was called dental fluorosis. This dentist attempted to blame the mother for the pitted teeth because she nursed her daughter at night – nature’s perfect food for infants doesn’t ruin their teeth, shame on this dentist for telling her that! While this family would qualify for the Children In Need of Treatment program for fluoride treatments and for filling of cavities, the program does not cover the costs of repairing dental fluorosis. The cost to repair dental fluorosis damage is much higher than the cost of fixing the half a cavity the ingested fluoride is supposedly meant to prevent. Consider how many ‘cosmetic dentistry’ practices we see these days. The family had to pay $700 to have their child’s baby teeth cosmetically fixed (they were worried about psychological effects of their child having brown marks on her teeth) and they won’t know what damage the fluoride toxicity will do to her adult teeth until they come in. Sadly, it does seem as though her dental fluorosis is an indication of her bone health. When she was only three and a half she fell a short distance off a couch onto carpet and fractured her arm. Her parents have invested in an expensive water filter system for drinking and cooking water, but as you can see if you read the mother’s account[ii] – they’re still concerned about the fluoride she’s exposed to through skin absorption in the bath and through food and beverages when they are not at home. Public health authorities like to say that drugging the water supply is an ‘equitable’ method for delivering fluoride. But it is low and middle income families that can’t afford avoidance measures and the huge costs of the repairs that aren’t covered by government programs or health benefits, because they’ve been deemed cosmetic. 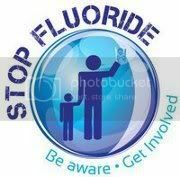 Too much fluoride is dangerous! Do you know how much your children are getting? One thing everyone agrees on is that too much fluoride is dangerous – which is why proponents of artificial water fluoridation always add the tag line ‘at optimal levels’ when making the claims that ingesting fluoride is ‘safe and effective’. We are told it is safe to drink fluoridated water every day for our entire lives, even though no one is considering the dose we’re ingesting and even though no one has determined our total fluoride exposure (forget about there being no toxicological data or clinical trials on the safety of ingesting hfsa!). You’ll recall that we asked a dentist how we would determine if our children are getting too much fluoride – must we wait until our children have dental fluorosis (that is if we are able to see it), the sign that they’re toxic with fluoride – isn’t that too late? We are responsible for monitoring our own fluoride exposure and our children’s fluoride exposure – and if you determine you’re getting too much, good luck avoiding it if you live in a community that has decided to drug the water supply with hydrofluorosilicic acid. We think we live in a moral society, so can’t we do better than this to protect our children? In this article we haven’t even touched on the risks of fluoride for infants; the babies exposed to hydrofluorosilicic acid and the co-contaminants of lead, arsenic, mercury and radionuclides – infants that don’t even have teeth yet! Nor have we discussed the risks to seniors as the fluoride builds up in their bones and leads to increased risk of hip fractures, not to mention that many seniors don’t have teeth anymore, either! And we haven’t explored how public health authorities justify endorsing the practice of swallowing an unregulated industrial waste product; those are topics for later articles, so stay tuned…or of course, you could always – and we suggest you do – research on your own and discover the truth about the dangers and risks of ingesting fluoride. The scientific method has a few basic requirements: that raw survey data be statistically analysed to control for the many variables which influence cavity rates and that examiner bias be controlled, among other things. Any data collection which does not follow these simple rules cannot be called science. Dr. Heimann omitted to inform CBC that a large volume of peer-reviewed, published research demonstrates that when you discontinue artificial water fluoridation, cavity rates do not change, or continue to decline. A recent Canadian study done by the dental officer of health for Toronto, (Azarpazhooh A, Stewart H. 2006) co-authored a meta-analysis of the research which compared communities still using artificial water fluoridation with communities which had stopped artificial water fluoridation (12 papers met the inclusion criteria). North American communities that discontinued fluoridation did not experience an increase in the incidence of dental caries. The communities which stopped artificial water fluoridation experienced a reduction in the incidence of dental caries in both absolute terms and relative to communities that continued to fluoridate their drinking water. Burt BA, et al. 2000. The effects of a break in water fluoridation on the development of dental caries and fluorosis. Journal of Dental Research 79(2):761-9. Clark DC, Shulman JD, Maupome G, Levy SM. 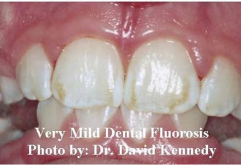 2006 Changes in Dental Fluorosis Following Cessation of Water Fluoridation. Community of Dental and Oral Epidemiology Jun;34(3):197-204. Kalsbeek H, Kwant GW, Groeneveld A, Dirks OB, van Eck AA, Theuns HM.1993 Caries experience of 15-year-old children in The Netherlands after discontinuation of water fluoridation. Caries Res. 27(3):201-5. Kobayashi S, Kawasaki K, Takagi O, Nakamura M, Fujii N, Shinzato M, Maki Y, Takaesu Y. 1992 Caries experience in subjects18–22 years of age after 13 years’discontinued water fluoridation in Okinawa. Community Dentistry and Oral Epidemiology. 20(2):81-83. Künzel W, Fisher T 2000 Caries prevalence after cessation of water fluoridation in La Salud, Cuba. Caries Res 34:20–25. Kunzel W, et al. 2000. Decline in caries prevalence after the cessation of water fluoridation in former East Germany. Community Dentistry and Oral Epidemiology 28(5): 382-389. Lekesova I, Rokytova K, Salandova M, Mrklas L 1996 Zastaveni fluoridace pitne vody v Praze. Progresdent 6:15-17. Maupome G, et al. 2001. Patterns of dental caries following the cessation of water fluoridation. Community Dentistry and Oral Epidemiology 29(1): 37-47. Seppa L, et al. 2000 Caries trends 1992-98 in two low-fluoride Finnish towns formerly with and without fluoride. Caries Research 34(6): 462-8. Natick Fluoridation Committee. 1997 The Natick Report: An Analysis of Water Fluoridation. Sept 27. Ziegelbecker R. Fluoridation in Europe (Letter to the Editor) FLUORIDE1 August 1998;31(3):171-174. Pizzo G, Piscopo M, Pizzo I, Giulliana G. 2007 Community water fluoridation and caries prevention: a critical review. Clinical and Oral Investigations Sep;11(3):189-193. Azarpazhooh A, Stewart H. 2006 Oral Health Consequences of the Cessation of Water Fluoridation in Toronto. 1 Quarterly Journal of the International Society for Fluoride Research. She was born in the fall of 2006. She was breast fed on demand. Around age 2, we noticed some white spots and opaque areas on her front teeth. She didn’t really drink milk or juice or consume sugar, but she did drink a lot of tap water. She soon developed pitting/mottling with yellowish brown marks on her four, front teeth. We took her to the dentist who then referred us to a pediatric dental specialist. She was 2 and a half. We were told that nursing a baby to sleep could cause this. I know that breast milk is the ideal food for an infant and does not promotes tooth decay. They “fixed” her teeth by filling in the fissures with a white material. It cost $700. It was scary for us to sedate our child at such a young age. They also recommended that we rub fluoridated toothpaste on her teeth every day. Something told us to not follow this advice. A year later, when she was 3 and a half, she fell off the sofa and fractured her arm. This was strange since she landed on soft carpet and the couch wasn’t even that high. She had to wear a partial cast with a sling. I now understand that this was also related to the toxic effects of hydrofluorosiolicic acid. That’s when we learned about how fluoride effects the bones and how excessive exposure to fluoride causes an arthrtiic bone disease called Skeletal Fluorosis. “Common sense should tell us that if a poison circulating in a child’s body can damage the tooth-forming cells, then other harm also is likely.” – Colquhoun J. (1997). Why I changed my mind about Fluoridation. Perspectives in Biology and Medicine 41:29-44. When she was 4, we got a reverse osmosis water filtration system installed in our kitchen. I also learned that that the fluoride gets concentrated when water is boiled. Now we drink and cook with water that is free of hydrofluorosilicic acid. But she still bathes in municipal tap water. Hydrofluorosilicic acid is readily absorbed into the body from showering or bathing. In fact, these chemicals are actually more dangerous when absorbed through the skin, because they enter the bloodstream more easily, bypassing the gut where they would bind with minerals from food, thus diminishing their harmful effects. We feel trapped because there’s no way for us to get away from it. She is now 5 years old. Her teeth are discoloured and we’re just waiting for them to fall out. We’re hoping that her adult teeth won’t be affected so she won’t have to live with the visual impact of the discoloration induced by fluorosis which can cause significant embarrassment and stress to the child, resulting in adverse effects on self-esteem and emotional health. But I have read that the damage that dental fluorosis causes to the internal matrix of the teeth is permanent. There is no way to reverse this damage There are only ways to hide the damage, to treat the surface of the teeth to hide the discoloration. I am saddened and angry that we are being medicated without our consent, with no dose control with an unregulated, toxic substance. All we want is safe water, is that too much to ask? Council members rely on the input of experts when making policy decisions because they must make decisions on a variety of issues and topics – all of which they can’t possibly be fully experts on. 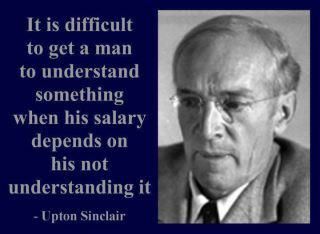 They must depend on outside sources to make informed decisions, they must do their due diligence to seek out these sources and they must use their critical thinking skills to apply the information when forming policy. Are health unit personnel credible experts? The current voice of the Public Health Unit comes from the Medical Officer, Dr. Heimann who we are aware has made FALSE and MISLEADING statements with respect to fluoridation. Can we blame Dr. Heimann for being misinformed or unaware of the facts, science or law with respect to artificial water fluoridation? – after all, he is not a fluoride expert. Having spent a significant part of his career in Public Health (scroll down), he may be an expert of the policy that endorses fluoridation. As the Medical Officer of Health part of his job is to promote fluoridation as safe and effective. However, Health Canada does not regulate hydrofluorosilicic acid nor are they able to provide a toxicological study that would prove the chemicals being added to our water are, in fact, safe for us to ingest every day of our lives. Indeed, no government or health authority on either side of the border has conducted a legitimate toxicological test nor conducted clinical trials to determine that ingesting hydrofluorosilicic acid is safe. Is there a difference between being an expert on fluoride and being an expert on endorsing fluoridation? Most proponents of artificial water fluoridation imply that the whole of the academic community supports fluoridation, but this is definitely not the case. There are many academics who have conducted, and continue to conduct, studies examining the effects of fluoride exposure, and these academics loudly warn of the hazards of fluoridation. A recognizable body of these folks would be the 12 selected scientists who were assembled by the National Academy of Sciences to review the existing literature on fluoride safety. After more than three years of painstaking analysis, they produced the 2006 NAS report, Toxicological Risk of Fluoride in Drinking Water. Their report was very skeptical of the claims that fluoridation is both ‘safe and effective’. These academics (one of which whom we’ve exchanged much correspondence with) warned of serious issues with fluoride safety, citing concerns about fluoride’s links to bone and soft tissue cancers, hypothyroidism, Alzheimer-like symptoms, and IQ deficits just to mention the short list. Their report urged that more research get underway quickly to closely explore all of those apparent risks. Often we hear fluoridation proponents give the impression that water fluoridation is accomplished using a natural product (calcium fluoride) but again, the academic community can help clarify that Windsor, Tecumseh and Lasalle residents are being ‘medicated’ with a toxic industrial waste by-product called hydrofluorosilicic acid. So what does constitute an EXPERT? With respect to fluoridation the field of expertise belongs to those who have examined the biological effects of swallowing fluoride. Whose area of expertise includes that study? No Faculty of Dentistry has in its curriculum the study of biological effects of ingested fluoride. Many dentists have independently sought that knowledge, and several have become pre-eminent authorities on the effects of fluoride. Those dentists would be ‘experts in this field’. Interestingly, Dr. Peter Cooney, Health Canada’s Chief Dental Officer, when questioned by Thunder Bay council (who went on to reject water fluoridation) had to admit that never fluoridated Vancouver has fewer dental caries than Toronto who has been fluoridating their water supply for over 30 years. However, he is not a fluoride expert either, yet continues to promote fluoridation as safe and effective as is required by his position as Chief Dental Officer. Can we agree that we expect our policy makers to seek the input of experts that have demonstrated ‘special skill or knowledge’ in the field of swallowing fluoride when making the decision to mass medicate the population with this industrial by-product? And can we agree that our policy makers should seek input from experts that are allowed to speak to their training and experience with respect to fluoride; rather than rely on experts that are instructed to disregard their experience or opinions in favour of policy endorsements as mandated by their position/access to income, or rely on experts that don’t have any special skill, knowledge, training or experience with respect to ingesting fluoride? Do such fluoride and fluoridation experts with special skill, knowledge, training and experience exist? And if they do exist, are they accessible to council members so that their knowledge and expertise may be applied to policy making with respect to artificial water fluoridation? So who are they, you’re wondering? They are scientists that have published peer-reviewed papers on fluoride and fluoridation, they are researchers, they are doctors, they are dentists, they are professors, they are lawyers…they have all the expected credentials and education one would hope to find in an expert but they have so much more than that! They have courage to speak out about the truth in opposition to heavily funded and desperately defended worn-out policy. They have the integrity to offer their expertise for free and ask only for their travel costs to be covered should their appearances be requested. They have veracity even when it has hurt their professional career potential. Windsor, Tecumseh and Lasalle council members are very fortunate to have such a class of individuals to seek the advice and expertise of – now all they need to do is pick up the phone or send an email and ask any and all questions with respect to the health authority claims that fluoridation is safe and effective or to ask questions about the water supply system license and the Ministry of Environment, or to inquire about the Safe Drinking Water Act, the Fluoridation Act or any other pertinent legislation, or to learn about all the recent studies linking fluoride to lowered IQ, increased lead levels in blood and cancer….or any imaginable questions with respect to the politics, science, law and practice of artificial water fluoridation. If you are a Windsor, Tecumseh or Lasalle policy maker reading this and have not received a list of these experts please contact us at fluoridefreewindsor@hotmail.com and we’ll be happy to forward you the contact information and credentials for this list of distinguished professionals. What we ask of our councillors is not that they judge duelling experts, but apply ethics, science and the rule of law regardless of ‘credentials’. And, when councillors do seek the input of experts – that they take the advice of Virgil, author of this article’s title, and believe the experts that have proved it.